Products and equipment all around us are made of materials: look around you and you will see phones, computers, cars, and buildings. We face challenges in securing the supply of materials and the impact this has on the planet. Innovative product design can help us find solutions to these challenges. This course will explore new ways of designing products. The design of products is an important aspect of a circular economy. The circular economy approach addresses material supply challenges by keeping materials in use much longer and eventually returning materials for new use. The principle is that waste must be minimized. Products will be designed to last longer. They will be easier to Reuse, Repair, and Remanufacture. The product will eventually be broken down and Recycled. This is Design for R and is the focus of this course. Experts from leading European universities and research organizations will explain the latest strategies in product design. Current design approaches lead to waste, loss of value and loss of resources. You will learn about the innovative ways in which companies are creating value, whilst securing their supply chains, by integrating Design for R.
This course is suitable for all learners who have an interest in product design, innovative engineering, new business activity, entrepreneurship, sustainability, circular economy and everyone who thinks that the current way we do things today needs a radical rethink. Learn “Design for R” strategies: reuse, repair, remanufacturing, and recycling. Integrate life-cycle design into your skillset and your company vision. Understand the strategic importance of raw material supply and conservation. Effectively balance value creation with industrial sustainability. Improve your strategic design skills to make better decisions. 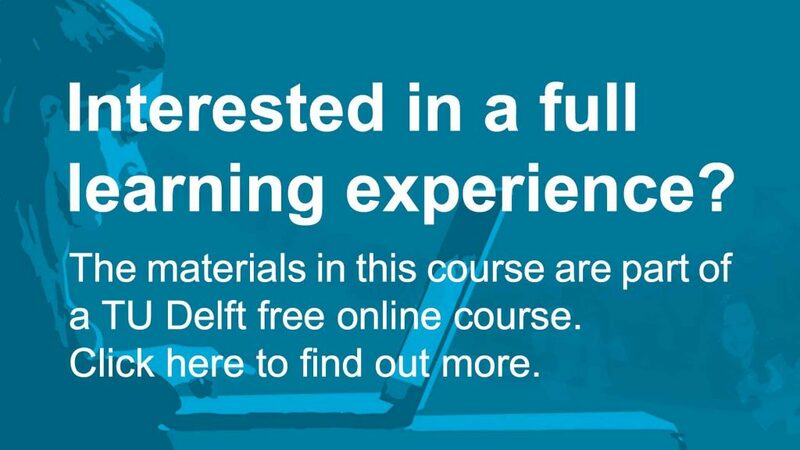 Engineering Design for Circular Economy by TU Delft OpenCourseWare is licensed under a Creative Commons Attribution-NonCommercial-ShareAlike 4.0 International License. Based on a work at https://online-learning.tudelft.nl/courses/engineering-design-circular-economy/.